The FBI building in Jackson, Miss.,officially has a pretty long name. The building this week is being named after three civil rights workers killed by Klansmen 47 years ago, as well as the FBI agent who headed the probe, the Jackson Clarion-Ledger reported. The paper reported that the James Chaney, Andrew Goodman, Michael Schwerner, and Roy K. Moore Federal Building is located at 1220 Echelon Parkway in Jackson. Roy K. Moore is the FBI agent. 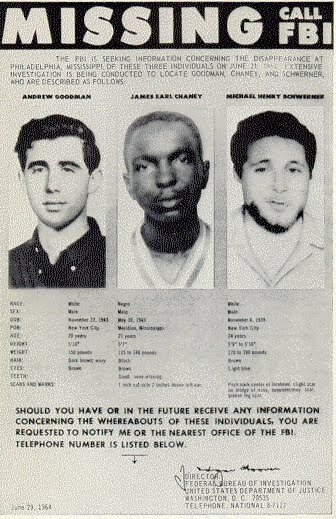 The three civil rights workers were killed June 21, 1964. Posted: 6/21/11 at 8:54 AM under FBI, Milestone, News Story.